The bronze sculpture Judith and Holofernes (1460), created by Donatello at the end of his career, can be seen in the Hall of Lilies (Sala dei Gigli), in the Palazzo Vecchio, Florence, Italy. 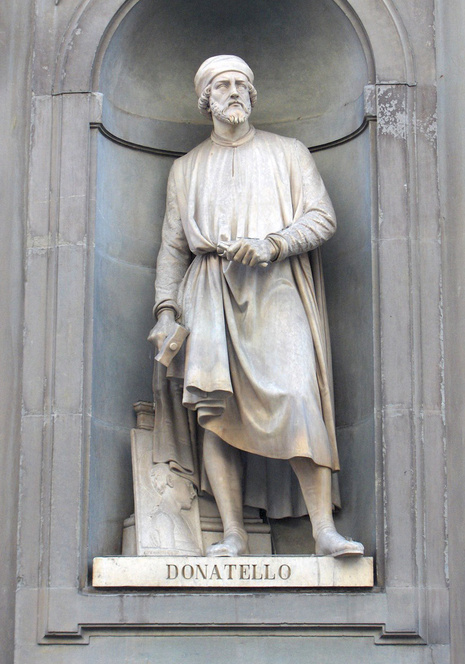 A copy stands in one of the sculpture's original positions on the Piazza della Signoria, in front of the Palazzo Vecchio. It depicts the assassination of the Assyrian general Holofernes by Judith and is remarkable for being one of the first Renaissance sculptures to be conceived in the round, with its four distinct faces. The statue was commissioned by Cosimo de' Medici as a decoration for the fountain in the garden of the Palazzo Medici-Riccardi. It stood in this palace together with Donatello's David, standing in the courtyard, both depicting tyrant slayers. These two statues are among the earliest freestanding Italian Renaissance statues. Judith is considered the symbol of liberty, virtue and victory of the weak over the strong in a just cause. She stands powerful with raised sword, holding the head of Holofernes by his hair. The statue was originally gilded and its shine in the sunlight must have made the onlookers stare at it; some gilding remains on the sword. 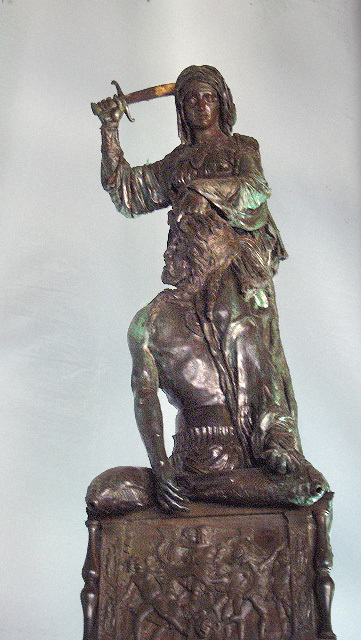 To facilitate the gilding the bronze was cast in 11 parts. The base of the sculpture resembles a cushion, a naturalistic device first used by Donatello for his St. Mark in the Orsanmichele. With the change in Florentine taste, all of Donatello's important commissions came from outside Florence. They included the dramatic bronze group Judith and Holofernes (later acquired by the Medici and now standing before the Palazzo Vecchio) and a bronze statue of St John the Baptist for Siena Cathedral, for which he also undertook in the late 1450s a pair of bronze doors. This ambitious project, which might have rivaled Ghiberti's doors for the Florentine baptistery, was abandoned about 1460 for unknown reasons (most likely technical or financial). Only two reliefs for them were executed; one of them is probably the Lamentation panel now in the Victoria and Albert Museum, London.